When we started working with Cupcakes By The Beach the most important thing we wanted to do was capture what the cupcakery was like. Their bakery has an intimate boutique feel to it, and is set in Downtown Fort Walton Beach. The company has done a great job building their brand. From having a defined logo, to keeping their colors consistent throughout their entire shop and products. The only thing that Cupcakes By The Beach was missing was a website. From the start we knew that we wanted to showcase the cupcakes, so we opted for a rotating gallery on the homepage that scrolls not only through cupcakes, but the store as well. 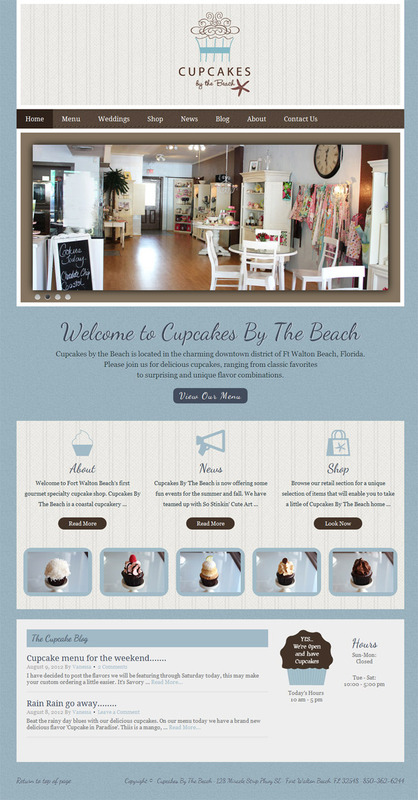 Cupcakes By The Beach has so many cupcake recipes, and they are constantly adding new flavors to their menu. We decided that we would add their entire menu to the site, and showcase their everyday cupcakes with a lightbox gallery. We did the same for their wedding cupcakes. YUM! Aside from cupcakes, the company carries specialty products like aprons and baking materials. Since these products are specialty and are not guaranteed to be in-stock, we decided against a full on e-commerce store. Cupcakes By The Beach has built a community out of their customers, and you sometimes lose that personal touch with online retail. Speaking of their “community”, the company has only been open for about 6 months and has gained close to 1,800 fans on Facebook. The staff does a great job engaging with their customers on the giant social network, and we felt that it was time to bring that engagement to their own domain. Through blogging and new updates our goal is to deepen customer loyalty to Cupcakes By The Beach, and continue to grow their brand.